Add ice to two glasses. Set aside. Add the coconut water, tea, coconut milk, and honey to the jar of a blender, and blend for a few moments to combine. 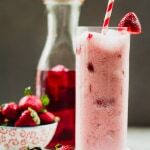 Add the strawberries, and blend for just a second (if you want them to remain chunky in the drink, like the original), or several seconds (if you want them to be pureed, more like a milkshake or smoothie) until you get the consistency you prefer. Divide the drink between the two prepared glasses. Garnish with additional strawberry slices, and enjoy! I used Celestial Seasonings Red Zinger tea, but you can also use Tazo Passion Tea for this recipe. You can use any hibiscus tea you prefer, but I recommend one of these two, if you can find them. You can use full fat or light coconut milk for this. Just make sure it is mixed well before measuring.